For many people, the peak of Summer brings high temperatures to the workplace. For others, high temperatures in the workplace are an everyday occurrence. Understanding heat stress and its attendant safety challenges is crucial for those working in hot environments. Heat stress is a physical hazard. It is caused by environmental conditions and results in the breakdown of the thermal regulating system of the human body. There are various degrees of heat stress. Each has its own unique symptoms. The most common form of heat stress is heat exhaustion. Symptoms of heat exhaustion include dizziness, confusion, headaches, upset stomach, weakness, decreased urine output, dark-colored urine, fainting, and pale clammy skin. If you think you are experiencing some form of heat stress, act immediately! 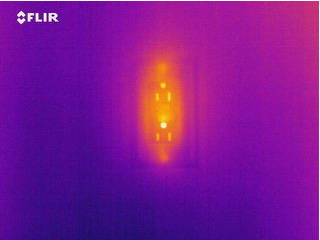 When performing an infrared inspection of an electrical panel, you may notice that the phenolic bodies of Ground Fault Circuit Interrupters appear warm. This same condition may also be observed on self-contained GFCI receptacles. This condition is usually due to the construction of the device itself. In order to monitor the amount of current flowing through the supply and neutral conductors of a circuit, GFCI devices have small transformers built into them. These transformers can cause the body of the GFCI to run several degrees warmer than ambient temperature. Depending upon the settings of your thermal imager, GFCI devices may show a marked contrast to their surroundings. When inspecting a GFCI device, compare its thermal pattern to other similar devices under similar load. For GFCI breakers, be sure to inspect the load side connection at the GFCI device as well as the neutral bus bar connection for the subject breaker. Electronic documents such as standards, proposal templates, and the ASNT-Compliant Written Practice are available for immediate download upon transaction approval. Infraspection Institute are pleased to announce that our 30th annual Advanced Training Conference, Technical Symposium and Technology Expo, IR/INFO, will be held January 20 – 23, 2019 in New Orleans, Louisiana. Now in its 30th year, IR/INFO features four days of networking, learning, and fun in a relaxed, yet professional, family atmosphere. We are presently seeking papers and presenters for IR/INFO. Invited topics include, but are not limited to: safety, emerging applications, building sciences, related NDT, case histories, as well as tips and tricks.